The following text is arranged according to the individual bays of the building as they appear in the Quick Time Virtual Reality panoramas and as a visitor today would tour the building. The iconographic narrative, however, sometimes digresses from following the arrangement of the architectural divisions, and such digressions will be noted where appropriate. Numbers in square brackets refer to the diagrams in Paul Underwood, The Kariye Camii, 4 volumes, New York, 1966. 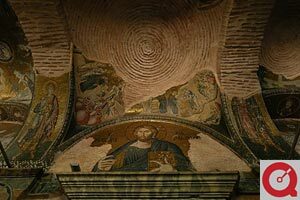 The pictorial decoration of St. Savior in Chora (Kariye Camii) was begun with (1) the mosaics in the naos, then continued with (2) the mosaic narratives in the narthexes, (outer narthex and inner narthex) concluding with (3) the frescoes of the parekklesion. The artistic style of the mosaics and frescoes reveal a well-defined canon of taste. In compositions, decoration is used to join otherwise disparate elements, adjusting to fit irregular spaces. The architectural backdrops are like stage sets, replete with draperies, shrubbery, and incidental details. The tendency is toward the disintegration of the composition; equilibrium is replaced by asymmetry, instability, and unrest. Figures have contorted postures, and sometimes seem to fly, their draperies fluttering in lively arabesques. In part, the mannered style was a response to the architecture. Fitting the narrative scenes onto the domical vaults and pendentives (the triangular corners joining the vault to the arches) encouraged the distortion of the composition, as in the inner narthex. The compositions are based on the accumulation of details, and the whole is held together by a decorative veneer. Individual figures are seen in unusual postures and from different viewpoints; they were probably derived from a variety of sources, including sketchbooks. The naos preserves a few mosaics. 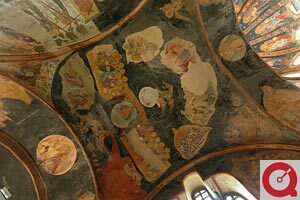 The vaults and upper walls were probably decorated with the major scenes from the lives of Christ and the Virgin, the so-called Dodekaorton or Feast Cycle, as was standard in a Byzantine church, along with a bust of Christ in the dome and the Virgin enthroned in the apse. To the left and right of the sanctuary are framed mosaic icons of Christ and the Virgin, who are shown in pendant images throughout the building. Christ's inscription is only partially preserved but originally read as "Dwelling-place (chora) of the Living" . The Virgin is inscribed "Dwelling-place (chora) of the Uncontainable" . Both play on the name of the monastery, Chora, giving it a mystical meaning as appellations of the Virgin and Christ. The only remaining part of this decorative program is the Koimesis, or Dormition of the Virgin, above the western entrance . Following a common Byzantine iconography, the Virgin lies on a funeral bier and is surrounded by the Apostles and other mourners. Behind her is Christ, who has descended in a blaze of glory to carry her soul—represented as a swaddled infant—up to heaven. Christ is garbed in gilded drapery, surrounded by a mandorla filled with elegant grisaille angels. View the QTVR of the Naos. The outer and inner narthexes are decorated with mosaic cycles of the lives of the Virgin and Christ. Both begin at the northern end, with thematic and visual references linking the two cycles. Christ Pantokrator (or Judge of All) is located above the central door leading into the inner narthex . The inscription reads "Jesus Christ, Dwelling-Place of the Living." Opposite Christ Pantocrator is the Virgin Blachernitissa, above the main entrance . She is inscribed "Mother of God, Dwelling-Place (or Container) of the Uncontainable." This particular type of the Virgin is sometimes called a Blachernitissa, as it was apparently modeled on a venerated icon housed in the nearby church of the Blachernae. View the QTVR of the central bay of the outer narthex. The Enthroned Christ and the Donor Theodore Metochites are located in the lunette above the entrance to the naos . Metochites kneels and presents a model of the church to a seated Christ. In Byzantine art, this was the standard way of representing an architectural donation. Metochites is ostentatiously garbed and wears a high hat symbolizing his important office and his court titles are inscribed behind him. Below the Enthroned Christ, flanking the doors to the naos, are SS. Peter and Paul [4, 5]. View the QTVR of the central bay of the inner narthex. Three bays of the inner narthex are devoted to the story of the Virgin, from miraculous birth to miraculous pregnancy. The unfamiliar subject is based on the Protevangelium, or Apocryphal Gospel of St. James, which was widely accepted during the Middle Ages. The Genealogy of Christ fills the two dome mosaics of the inner narthex in the northern and southern bays [7-81]. The mosaic encrusted domes are known as pumpkin domes with undulating, faceted surfaces. The result is multiple curves that capture the light from many angles, creating a shimmering surface and suffusing the interior with a golden glow. The Bust of the Virgin, surrounded by the royal ancestry, is in the north dome and the Bust of Christ is in the south dome. Scenes from the story of Joachim and Anne fill much of the northwest to southeast areas of the first bay of the inner narthex. Joachim's Offerings Rejected is represented in the northwest pendentive below the dome . The bearded priest Zaccharias is shown praying in the Temple, which looks much like the sanctuary of a Byzantine church. Joachim in the Wilderness is in the southeast pendentive, showing a forlorn Joachim contemplating his misfortune . The Annunciation to St. Anne is located in the partially preserved lunette below . As she prays in the garden, an angel announces to Anne that she will bear a child. The Meeting at the Golden Gate is on the arch between the first two bays and includes the happy Joachim meeting and embracing Anne at the gate of Jerusalem . The scene is inscribed "The Conception of the Theotokos" ("Bearer of God"). Scenes from the story of Joseph and the Virgin fill the southwest area of the first bay of the inner narthex. Joseph Taking the Virgin to His House is located on the arch between the second and first bays . Accompanied by one of his sons, Joseph leads the Virgin. Here Joseph is one of the artist's experiments, a composite figure probably created from two different sketchbook models. Is he coming or going? The Annunciation to the Virgin at the Well, is in the southwest pendentive of the first bay . An angel announces to the Virgin that she will give birth. The drama is emphasized by the position of the Virgin, who seems to be flying. Joseph Taking His Leave of the Virgin and Joseph Reproaching the Virgin, in the lunette of the first bay, when he returns from his trip to find his wife with child . These scenes offer interesting parallels to the story of Joachim and Anne, with which the cycle began. Both Anne and the Virgin Mary are blessed with miraculous conceptions. View the QTVR of the first bay of the inner narthex. The Birth of the Virgin, in the lunette of the second bay, shows Anne reclining on a bed, attended by servants who prepare a bath for the infant Virgin Mary . Joachim peers timidly through the doorway. The Nativity of Christ is very similar in composition and is in the same position in the outer narthex. The First Seven Steps of the Virgin is on the arch between the second and third bays . The Virgin surprises her mother by walking at six months; Anne subsequently vows that her daughter shall be raised in the Temple. The Virgin is Blessed by the Priests is in the vault above, on the western side . Joachim carries the child, his hands covered, as if bearing a sacred object. Throughout the cycle, the Virgin is represented as a tiny adult, always dressed in a blue robe. The Virgin Caressed by Her Parents is in the same vault on the eastern side . The architectural backdrops of the two scenes are oddly contorted to fit the curved surface of the vault. Within the space of this bay, the story jumps to a later moment in the Virgin’s adult life in the western lunette, directly opposite the Birth of the Virgin . The Virgin Entrusted to Joseph, in the west lunette of the second bay , emphasizes the couple's age difference, as the high priest, holding the flowering rod, presents the Virgin to Joseph with the other suitors watching. View the QTVR of the second bay of the inner narthex. The Presentation of the Virgin in the Temple is in the vault of the central bay . The Virgin Mary is given to be raised in the Temple at the age of three. She is shown again in the same panel, seated inside the Holy of Holies, where she is fed manna by an angel. The Virgin Fed by an Angel , in the adjacent arch, is located above the figure of St. Paul. The Temple resembles a Byzantine church sanctuary, with the Virgin seated on the altar, below a canopy. The Instruction of the Virgin in the Temple (damaged) is on the opposite haunch of the same arch . Its composition was similar to the previous scene. The Virgin Receiving a Skein of Purple Wool is in the west lunette of the central bay . The Virgin is presented with wool, symbolizing her purity, with which she is to weave the veil of the Temple. Zaccharias Praying before the Rods of the Suitors is on the arch between bays two and three  opposite the First Seven Steps of the Virgin . The high priest is shown praying over the twelve rods presented by the Virgin's suitors. When the Virgin was twelve years old, the priests decided she should leave the Temple. Zaccharias was instructed by an angel to select a husband for her from among the widowers. According to the angel's instructions, each suitor presented a rod, which was left in the Holy of Holies overnight. The rod belonging to the old man Joseph miraculously blossomed. The cycle of the Life of the Virgin is left unresolved in the pictorial decoration of the inner narthex, but the story continues in the outer narthex with the cycle of the Infancy of Christ. View the QTVR of the third bay of the inner narthex. The cycle begins in the domical vault of the first bay of the outer narthex and concludes in the south bay of the inner narthex. The story is taken up directly from the previous narrative. As in the inner narthex, the narratives are sometimes contorted to fit the domical vaults. Normally two different episodes appear in each vault. The cycle of the Infancy of Christ is represented in the lunettes, while the domical vaults are decorated with scenes of the ministry of Christ. Both are based on the Gospels and begin in the north bay. Joseph Dreaming is in the lunette on the north wall. While asleep, he is informed by an angel of the truth concerning the Virgin's pregnancy, thus providing a resolution to the final scene in the inner narthex. Behind Joseph is the Virgin and Two Companions, engaged in conversation outside Nazareth. To the right, the holy couple begins the Journey to Bethlehem to be enrolled in the Roman census . The Enrollment for Taxation is in the first lunette of the east wall . In this unique scene, the Virgin and Joseph appear before an enthroned tax collector, who wears the regalia of a Byzantine court official. The narrative within this bay shifts to Christ Taken to Jerusalem for Passover, in the first lunette  opposite the Enrollment for Taxation. The walled city of Jerusalem fills one side of the space; in the center, Joseph leads the family. Christ appears as an adolescent in a gold robe. The domical vault contains scenes from both the Infancy and the Ministry cycles. Christ among the Doctors is largely destroyed . On the north side are the steps of the synthronon, the seat for the priests in the Temple. The lower portion of Christ's gold robe is preserved to one side. The story of John the Baptist begins in the south half of the vault in the first bay with John the Baptist Bearing Witness of Christ . The emaciated legs and camelhair garment of the Baptist can be discerned on the riverbank in the southwest corner. In a vignette, children wrestle on the riverbank. View the QTVR of the first bay of the outer narthex. The second bay of the outer narthex includes scenes from both the Infancy cycle as well as the Ministry of Christ. The Nativity, in the second lunette, displays standard Byzantine features . The setting is a cave. The Virgin reclines on a mattress while Joseph ponders the miracle of the Virgin Birth. The Christ child appears twice, once in the manger, and once being bathed by midwives. Over the hill, angels and the star announce the birth to the shepherds. Opposite the Nativity is Joseph Dreaming in the second lunette, north of the entrance. An angel informs him in a dream that it is safe to return to Palestine. This is followed by the Return of the Holy Family from Egypt . Joseph carries the infant Christ piggyback as they return to Nazareth. The city fills the right side of the lunette. John the Baptist Bearing Witness of Christ fills the domical vault of the second bay of the outer narthex in a circular composition . On the north side, John the Baptist gestures toward Christ and testifies to his divinity, saying "This was He of whom I spake, He that cometh after me is preferred before me: for He was before me." In a detail, a heron attacks a snake, perhaps symbolizing the overcoming of sin through baptism. The Temptation of Christ, in the southern half of the second vault, shows four episodes of Christ being confronted by the Devil , divided into several scenes, including (1) the Devil challenges Christ to prove his divinity by changing the stones into bread; (2) Christ is offered the kingdoms of the world if he will worship the Devil; the kingdoms are represented in a small, fortified enclosure; (3) the Devil takes Christ to the mountaintop to show him the kingdoms, and (4) Christ stands on the pinnacle of the Temple, where the Devil asks him to prove his divinity by casting himself down unharmed. View the QTVR of the second bay of the outer narthex. The Miracle at Cana, in the third vault of the outer narthex, is damaged . On the north side are episodes from the wedding at Cana, although the main scene of banqueting has been lost. In the northeast corner is the miracle of the transformation of water into wine. Workers fill large pithoi with water. Christ, accompanied by the Virgin, Peter, and John, gestures toward the pithoi as the host offers him a tumbler, apparently unaware of the miracle that has just occurred. The Multiplication of Loaves, in the south half of the same vault, is an episode from the Miraculous Feeding of the Five Thousand . In the eastern corner, Christ blesses the five loaves and, breaking them, gives them to two disciples to distribute to the multitude. After the meal, the remaining fragments fill twelve baskets, which appear in the southwest corner. Set on the main axis of the building, the Miracle at Cana and the Multiplication of Loaves are given special prominence. Here, the theme of Incarnation is expressed in spatial terms, with numerous references to the Virgin as "Container of the Uncontainable." This appears in the scenes of the Miracle at Cana and the Multiplication of the Loaves. In both, containment is expressed by large vessels, pithoi, of wine and baskets of bread that fill the pendentives. Bread and wine, symbolizing the body and blood of Christ, are inside containers, powerfully juxtaposed against the image of the Virgin as Container of the Uncontainable. Bread and wine are also the elements of the Eucharist, representing Christ's sacrifice for the redemption of man's sins. These images begin what we might call the liturgical axis of the building, leading from the main entrance to the altar, where the Eucharist was administered as the culmination of worship. It is well to recall here that the central bay also includes Christ Pantocrator and the Virgin Blachernitissa opposite each other in the lunettes above the doors. The fourth bay of the outer narthex continues with scenes from the Infancy of Christ. The Journey of the Magi, in the fourth lunette, is located to the right of the entry axis. The Magi appear riding spirited horses, following the star; The Magi before Herod are shown carrying gifts and dressed as priests, before an enthroned Herod . The Flight of Elizabeth and John is in the lunette opposite the journey of the Magi . With a soldier in hot pursuit, his sword raised, Elizabeth and her son, the future John the Baptist, escape miraculously when a mountain opens up to hide them. The mosaics of the next two vaults are almost entirely lost. In the fourth bay, however, one can discern the lower portions of Christ confronting a spotty-legged leper in the episode of Christ Healing a Leper . View the QTVR of the fourth bay of the outer narthex. The east side of the fifth bay of the outer narthex continues the Infancy of Christ. Herod Inquiring of the Priests and Scribes, in the fifth lunette, is partially preserved . Troubled, Herod searches for the newborn King of the Jews. Opposite Herod Inquiring of the Priests is The Mothers Mourning Their Children in the west lunette of the fifth bay . The evocative vignettes convey the emotion of the scene. Grief is shown in women's gestures and expressions as they hold their slain and dismembered offspring. View the QTVR of the fifth bay of the outer narthex. The sixth bay of the outer narthex includes scenes from both the Infancy of Christ and the Ministry cycles. The Massacre of the Innocents is in the south lunette of the sixth bay . In an attempt to remove his potential rival, Christ, Herod orders the massacre, and his soldiers set out in pursuit of innocent Jewish children. The Soldiers Slaying the Children is in the west lunette of the sixth bay . The narrative focuses on details to represent the massacre. Christ Healing the Paralytic at the Pool of Bethesda [121, 128], in the large domical vault at the southwest corner, originally contained eight scenes of Christ's healing miracles, of which significant portions of three remain. In two related episodes in the northeast corner, the paralytic sits stiffly in bed; miraculously cured, he carries the bed frame on his back. Christ Healing the Paralytic at Capernaum is in the southwest corner of the same vault . Christ addresses the paralytic, who is richly outfitted in bed and accompanied by four bearers. Christ and the Samaritan Woman at the Well is in the northwestern pendentive of the same vault . Other scenes in this vault are preserved only in fragments. Christ Healing the Blind Born  is located in the northeastern pendentive. View the QTVR of the sixth bay of the outer narthex. The Return of the Magi to the East is in the east lunette of the seventh bay of the outer narthex above the arch leading to the parekklesion . This is only partially preserved, showing a rider on a rearing horse. The Flight into Egypt, in the south lunette of the seventh bay, is partially damaged . According to tradition, while fleeing from the wrath of Herod the Holy Family passed the city of Sotinen in Egypt, whereupon the city's 365 pagan idols were destroyed leading to the conversion of the population. Statues are shown taking flying leaps from their pedestals. The Byzantines believed that pagan statues were animated by demons, which may explain their vivacity. Only small fragments remain of the mosaics in the large domical vault in the seventh bay at the entrance to the parekklesion. At the south side the scene may be identified as Christ Calling Zacchaeus . As Christ passed through Jericho, the publican Zacchaeus climbed a tree in order to see him. View the QTVR of the seventh bay of the outer narthex. The narrative cycle of the Ministry of Christ concludes in the inner narthex beneath the dome containing the early ancestors of Christ, which we may also regard as the beginning of the successive cycles. The narrative cycles have, in effect, come full circle, emphasizing the divine plan of salvation. Christ Healing a Blind and Dumb Man is in the southwest pendentive . Christ, standing with St. Peter, gestures toward the afflicted man, who points toward his eyes. Christ Healing Two Blind Men is in the northwest pendentive . Accompanied by two apostles, Christ gestures toward two seated sightless men. Christ Healing Peter's Mother-in-Law is in the northeast pendentive . She is seated in bed, while Peter stands to her side, and Christ grasps her by the wrist. Christ Healing the Woman with the Issue of Blood is in the southeast pendentive . The afflicted woman lies prostrate on the ground touching the hem of Christ's garment as he turns to address her. Christ Healing the Man with the Withered Hand is on the eastern side of the southernmost arch . The man holds his deformed arm toward Christ, who gestures toward him. Christ Healing a Leper is on the western side of the same arch . The latter wears a loincloth and is recognizable by his spots. The figure of Christ is missing except for his feet. Christ Healing a Multitude is in the west wall of the bay . Christ, accompanied by apostles, addresses a group that includes three seated men: a blind cripple with a hand crutch, a blind man, and another with a distended tumor. Behind them, a woman presents her child with deformed legs; another woman and child appear behind her. In the group of standing figures to the right are a crippled man, a blind woman, and a woman leaning on a stick. As with the life of the Virgin, the cycle of Christ’s Infancy also appears unresolved, ending with a transition that leads directly to the cycle of Christ’s Ministry. The fourth bay of the iner narthex also contains the monumental Deesis mosaic, located to the right of the door into the naos, showing Christ and the Virgin with two previous benefactors of the monastery kneeling at their feet. The Virgin gestures to Christ in intercession for the benefactors . View the QTVR of the fourth bay of the inner narthex. The funerary chapel contains prefigurations of the Virgin and Themes of Resurrection and Judgment. Like the narthexes, the program of the parekklesion is divided between the Virgin and Christ. Here, however, the overriding theme is Salvation, befitting a funeral chapel. The western domed bay is devoted to the Virgin; the upper walls represent Old Testament prefigurations of the Virgin, emphasizing her role in Salvation. The eastern bay is devoted to the Last Judgment. The complex program of the chapel culminates in the conch of the apse, where the Anastasis (Harrowing of Hell) is represented, flanked by scenes of resurrection. Unlike the narthexes and the naos, the parekkelsion is decorated with frescoes. The first bay of the parekkelsion is covered by a ribbed dome lit by large windows. The Virgin and Child and Attendant Angels are represented in the western dome [211-223]. The Virgin appears as the Queen of Heaven at the apex of the dome. Within the dome's segments are twelve angels, who form a sort of guard of honor, wearing brightly colored costumes of the Byzantine court. This frescoed dome is subdivided with ribs providing the flatter surfaces more suitable for fresco. Theophanes Graptos, in the northwest pendentive, a ninth-century writer who was a monk at the Chora. He is shown writing verses from the funeral service, which refer to the adjacent scene of Jacob's Ladder and to the role of the Virgin in salvation. Jacob Wrestling with the Angel and Jacob's Ladder is in the lunette at the west end of the north wall . In the first, he wrestles with the angel, during which he sees God face to face. In the second, he dreams of the ladder leading to heaven, with angels ascending and descending, and the Lord standing upon it. Jacob's Ladder was regarded as a prefiguration of the Virgin, and accordingly the ladder is depicted leading to an image of the Virgin and Child. The Lord Appears to Moses Before the Burning Bush is on the opposite side of the lunette [229, 230]. Realizing he is standing on holy ground, Moses Removes His Sandals. On the adjacent arch is a third episode, Moses Hides His Face, "for he was afraid to look upon God." The Burning Bush, which burned without being consumed, was regarded as a metaphor for the Virgin, signifying the Virgin Birth. Scenes from The Dedication of Solomon's Temple fill the south wall of the parekklesion. The Bearing of the Ark of the Covenant to the new Temple located on the west side of the lunette in the second bay . Typologically the Ark and the Virgin are related, and the scenes parallel those of the Virgin's presentation and life in the Temple, depicted in the inner narthex; both Virgin and Ark are containers of God. The Bearing of the Sacred Vessels is located on the southern side of the arch separating the first and second bays . Solomon and All of Israel is on the east half of the lunette in the first bay . Solomon, who is richly dressed as a Byzantine emperor, leads the elders of Israel. The Installation of the Ark in the Holy of Holies is on the west side of the lunette on the south side of the first bay . It shows the Ark being placed in the sanctuary of the Temple. Light radiates from the sky above to show that the "glory of the Lord" has filled the Temple. The Prophesy of Isaiah concerning the army of Sennacherib, who was unable to enter the walled city of Jerusalem, is on the southern side of the western arch . Isaiah holds a scroll and gestures toward The Angel Smiting the Assyrians before Jerusalem. Between the prophet's outstretched hand and the angel, the gate of Jerusalem is topped by an image of the Virgin in the tympanum. Here, the inviolate city is a symbol of the Virgin. Although the prophesy of Isaiah was not read on the Virgin's feast days, the inclusion of this scene may be related to Theodore Metochites' personal devotion to the Archangel Michael. Completing the cycle of Old Testament prefigurations of the Virgin is a somewhat unusual scene of Three Priests before the Altar . Originally identified as Aaron and his sons, the fragmentary inscription in fact refers to the burnt offering to be made on the eighth day on the altar, from the vision of Ezekiel. The altar of sacrifice symbolizes the Virgin, and the sacrifice refers to Christ's sacrifice. The priests are shown carrying small boxes and a censer. Both formally and typologically they refer to the Three Magi, whose cycle terminated in the adjacent seventh bay of the outer narthex. The Souls of the Blessed in the Hand of God (fragmentary), an unusual scene, is in the crown of the western arch extending onto the western tympanum [237, 238]. Following the Book of Wisdom (of Solomon), "the souls of the righteous are in the hand of God, and the tortures of death shall not touch them." In the center of the arch separating the first and second bays of the parekklesion is a portrait medallion of Christ . View the QTVR of the second bay of the parekklesion. The Last Judgment, in the eastern bay of the parekklesion, shows Christ's triumph over death and redemption of the righteous, a fitting subject for a funeral chapel [204-210]. A structural crack runs through the dome and has disfigured much of the fresco. Note that Christ's mandorla is now egg-shaped when it should be circular. Appearing at the Second Coming, Christ is seated on a rainbow, surrounded by a mandorla of light, as judge of mankind. Flanking Christ stand the Virgin and John the Baptist who intercede on behalf of mankind. The twelve apostles are enthroned in symmetrical groups either side. Choirs of the Elect appear on four clouds that form a semi-circle on the northeast and western parts of the vault. Directly below Christ the Judge are the Hetoimasia and the Weighing of Souls. The first is the prepared throne of "justice and judgment" mentioned in Psalms. Either side, Adam and Eve prostrate themselves in prayer. Directly below the throne hangs a scale, on which the angels weigh the deeds of souls. The Fiery Stream and the Lake of Fire descends from the left foot of Christ and runs into the southeast pendentive. The Land and Sea Giving up Their Dead, is in the southwest pendentive. As angels blow their trumpets, bodies rise from their coffins and the sea. An Angel and a Soul occupy the northwest pendentive. Uniquely in this composition, an angel presents a soul for judgment. It has been suggested that this represents St. Michael presenting the soul of Theodore Metochites for judgment. Lazarus the Beggar in Abraham's Bosom, in the northeast pendentive, is surrounded by the souls of the blessed. The scene is set in paradise. The Rich Man in Hell is set opposite Lazarus, in the southeast pendentive, below the fiery stream. Seated, he turns toward Lazarus to beg for water. The Torments of the Damned, on the south wall, on the eastern half of the lunette adjacent to the Rich Man in Hell is divided into four compartments. The monochrome figures suffer a variety of tortures: the Gnashing of the Teeth (badly flaked), the Outer Darkness, the Worm that Sleepeth Not, and the Unquenchable Fire. The Entry of the Elect into Paradise, in the north lunette of the east bay, is the final episode in the Last Judgment composition. The scene is divided into two halves with the gate of paradise in the center. From the left a mixed group of figures, representing different categories of the elect, is led by St. Peter, who applies his keys to the gate. On the right, paradise is white and vegetated. The Good Thief, wearing a loincloth and carrying his cross, welcomes the elect. He gestures toward the Virgin. View the QTVR of the first bay of the parekklesion. 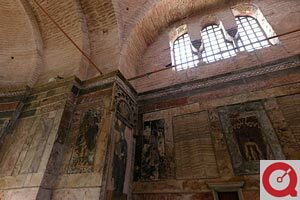 The Anastasis, or Resurrection, is located in the conch of the apse, one of the most impressive works of Late Byzantine painting . It depicts Christ’s triumph over death through his descent into hell to redeem the souls of the righteous of the Old Testament who, led by John the Baptist, gather before rocks on each side. He grasps Adam and Eve by their wrists and lifts them from their sarcophagi. Beneath him lies Satan bound and gagged. The Virgin Eleousa is located on the lower wall to the right side of the apse . She must have been paired with a fresco of Christ on the opposite side, now lost. The type of representation is known as the Compassionate Virgin. She holds the Christ child on outstretched arms, as though making an offering, and sadly presses her cheek to his. The Church Fathers appear in the apse in liturgical dress [243-248]. The left-hand figure has been lost, but the others may be identified as Saints Athanasios, John Chrysostom, Basil, Gregory the Theologian, and Cyril of Alexandria. The Raising of the Widow's Son is on the north side within the arch each side of the apse . The funeral cortège has left the city of Nain with four men carrying the body on a bier. The widow of Nain's son is wrapped in a winding-sheet and sits up as Christ gestures toward him. The Raising of the Daughter of Jairus is on the south side of the same arch . The scene is set indoors, with the deceased on a bed. Christ grasps the girl by the wrist and raises her to a sitting position, and back to life, watched by apostles and family members. Separating these scenes is a portrait medallion of the Archangel Michael . View the QTVR of the apse of the parekklesion. This concludes the tour of the iconographic program of the Church of St. Savior in Chora. This discussion of the Kariye Camii iconography is adapted from Robert G. Ousterhout, The Architecture of the Kariye Camii in Istanbul, Washington, D.C.: Dumbarton Oaks Research Library and Collection, 1987. We would like to thank Professor Ousterhout for generously allowing us to adapt his text for this Web site. QTVR node featuring southwest wall of naos. QTVR node featuring vault of outer narthex. QTVR node featuring vault of parekklesion.